Very vintage for European Market. 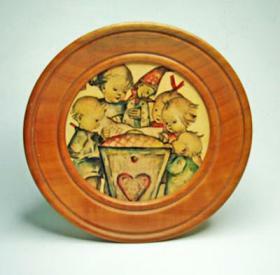 Image of children surrounding cradle and perhaps singing a lullaby is applied to the center of a 6" round hardwood frame. This makes a very sweet musical wall hanging box. The Swiss Reuge mechanism "Go to Sleep my Baby" is generated by pull sting. These particular boxes have been cleaned and refurbished if necessary and carry our normal 1 year guarantee against defective workmanship and materials.